One of my favorite appetizers is Fried Calamari. If I find this on the menu when I dine out, I mostly go with this. Not all restaurants serve crispy calamari though. Sometimes it doesn’t turn that crispy, it’s just fried and that really disappoint me. I’d been trying to fry crispy calamari for a while now. Finally, I’ve succeeded in making the crispiest fried calamari. It’s all about the ingredients used for coating the calamari rings and has to be fried in hot oil. 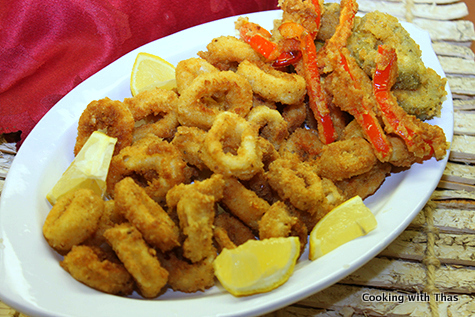 Very simple recipe and you are guaranteed to have crispy calamari rings. I also fried pickled jalapeños and red pepper wedges, these gave a nice kick when eaten with calamari rings. My search for making crispy Calamari has officially ended. 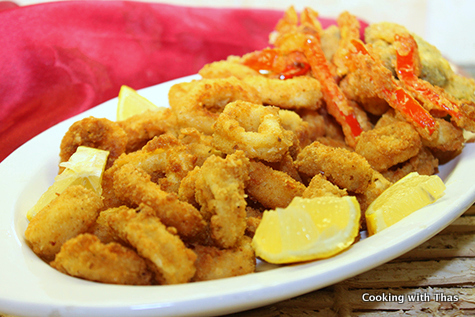 Rinse the calamari rings under running water, pat dry well using kitchen paper towel. Very important to dry them. Keep aside. Have corn starch, beaten eggs and bread crumbs ready taken in separate bowls. You could use seasoned breadcrumbs. If using plain bread crumbs, add some seasonings to the bread crumbs: I used Piri Piri seasoning- 3 tbsp and a few pinches of salt. 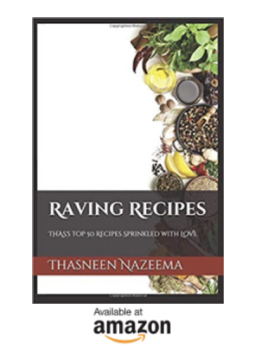 You could use cajun seasoning, literally any kind of spices or seasonings works. Take a calamari ring, first dip it in corn starch, shake off the excess. Next dip it in beaten egg and finally dip it in bread crumbs, shake off any excess. Place on a plate. Repeat with other calamari rings till you have everything ready for frying. You can refrigerate the coated calamari rings for up to 2 to 3 hours. I also fried pickled jalapeños and red pepper wedges- these give a nice kick when eaten with fried calamari. Pat dry, pickled Jalapeños- 8 round slices. Do not use fresh jalapeños. Cut a red pepper into wedges. Coat them with corn starch, egg and bread crumbs, keep aside. Place a frying pan over high heat, add oil enough for frying. Make sure oil is hot. Add the calamari rings without crowding. Fry till they turn golden brown- for 3 minutes. After you have fried calamari- fry pickled jalapeños and red pepper wedges. Serve immediately when warm along with lemon wedges and your favorite dipping sauce. It's so crunchy, the best fried calamari ever. Loved the spicy salty taste from the fried pickled jalapeños gave that amazing kick. You could replace calamari with shrimp, chicken nuggets, vegetables etc.